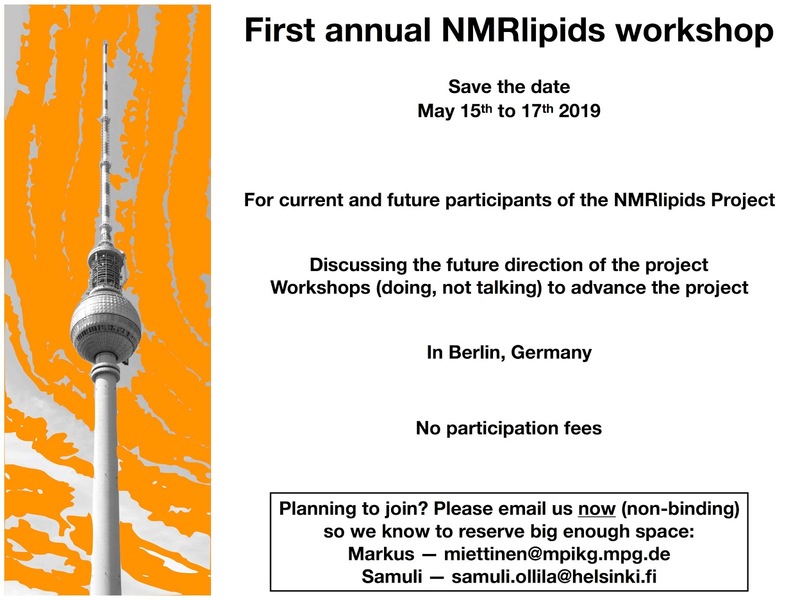 22.11.2018 The first annual NMRlipids workshop is coming! 20.9.2018 Homepages of my group are now published. Check and share also the announcement of open Ph.D. student position. 15.9.2018 Google has launched a new Dataset search engine. It seems to find the data from NMRlipids project very well. 4.7.2018 A lot of data has been contributed to the NMRlipids III and IV projects. Especially the NMRlipids III project is delayed because the main focus has recently been in the ion-membrane interactions. Currently the first priority is to finish the manuscript about PS lipids from NMRlipids IV, the second to finish the manuscript about lipid-cholesterol interaction from NMRlipids III, and the third to progress the manuscript about PE and PG lipids. 4.7.2018 NMRlipids IV: First draft of the manuscript about PS lipids post was published. 3.5.2018 Samuli Ollila received a academy research fellow position from the academy of Finland for five years. The research plan includes the development of the NMRlipids project. 30.1.2018 Database of the NMRlipids simulations and experiments post was published. 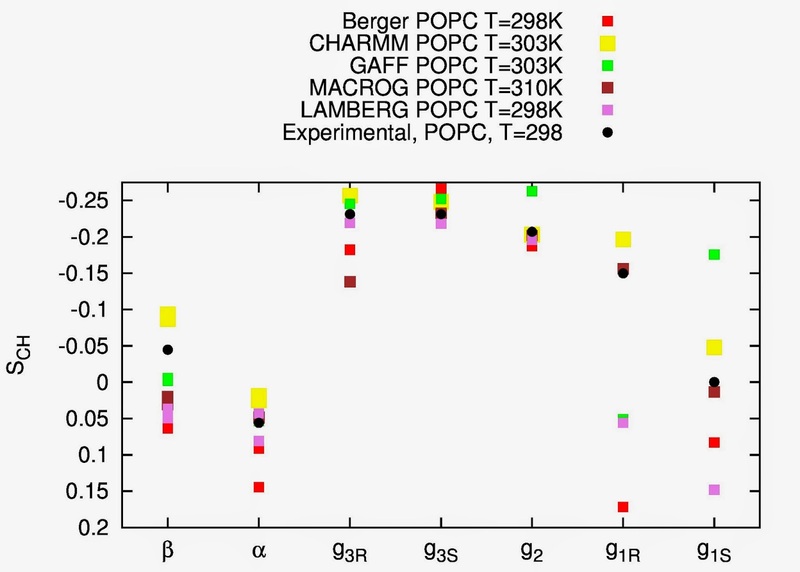 8.12.2017 Results from CHARMM36 simulation with cationic surfactants was added to Quantifying the effect of bound charge on headgroup order parameters post. 27.7.2017 Quantifying the effect of bound charge on headgroup order parameters post was published. 31.3.2017 NMRlipids III: Preliminary version of the manuscript post is published. 9.3.2017 NMRlipids IV: Headgroup & glycerol backbone structures, and cation binding in bilayers with PE, PG and PS lipids post is published. Almost any kind of simulations of these lipids in bilayers would be useful at this stage. 15.2.2017 My activity in NMRlipids project has been low during the last months due to other commitments. However, I have now again possibility to advance NMRlipids III and IV projects (updates will follow soon). We have also published a blog post about the future of NMRlipids project. 29.11.2016 NMRlipids project will be presented in PHOS16 Conference (Philosophy and History of Open Science) held in Helsinki on 31.11.-1.12.2016. There should be also live stream available. 12.11.2016 NMRlipids II manuscript Molecular electrometer and binding of cations to phospholipid bilayers accepted for publication in Physical Chemistry Chemical Physics, and the preprint is available on the journal web page. 16.10.2016 Zenodo has been updated as described in their news page. There are a lot of improvements but this one is probably the most important for us: "The current 2GB per file limit is removed, in favour of a 50GB per dataset limit". This means that we do not have to split the trajectories in 2GB pieces anymore. 7.10.2016 The final version of NMRlipids II manuscript (lipid-ion interactions) submitted to Physical Chemistry Chemical Physics. 9.9.2016 NMRlipids II manuscript (lipid-ion interactions) "accepted for publication after revisions" to Physical Chemistry Chemical Physics. 13.7.2016 NMRlipids II manuscript (lipid-ion interactions) has been now submitted to Physical Chemistry Chemical Physics. 1.7.2016 NMRlipids III: Preliminary observations post was published. 30.5.2016 Toward submission of NMRlipids II publication (lipid-ion interactions) (2) post was published. 20.5.2016 The new data delivered for NMRlipids II project raised a question about the order parameter responses on bound charges in CHARMM36 model. If you have CHARMM36 simulation data of PC bilayer with known amount of charged amphiphiles and you are willing to share it for the project, please let us know. 24.2.2016 Our goal from the beginning has been to immediately publish all the scientific content related to the project. One relevant part of the content are discussions between reviewers and authors during the peer review process. We have now published two peer reviewed articles: NMRlipids I and NMRlipids V. In both cases we have asked from the editor if we can publish also the reviewers' comments since everything else is public. As expected, in the NMRlipids I case the Journal of Physical Chemistry staff replied that this is not possible. However, editorial and publishing teams of BBA Membranes' were positive about publishing the referees' comments in the case of NMRlipids V publication. Both referees were also sympathetic to the idea. However, one of them declined stating permission to make comments available should be asked a priori, at the same time referees are invited to review a paper. This is an important learning point from this experience. 25.1.2016 The review written in the NMRlipids V project has been now accepted to be published in BBA - Biomembranes and is available also from their webpage. 19.1.2016 Does the glycerol backbone structure depend on initial structure? post was published. 21.12.2015 Towards submission of NMRlipids II publication (lipid-ion interactions) post was published. 24.11.2015 The review written in the NMRlipids V project has been now submitted. 29.10.2015 The NMRlipids I publication is already available also through the journal website. 28.10.2015 The first manuscript (NMRlipids I) based on the data and discussions presented through this blog is now accepted to be published in the Journal of Physical Chemistry B. We thank all the contributors and followers for courage to participate this project. 13.10.2015 We have received a new revision request for the first manuscript (NMRLipids I project). The first version of the reply is already in GitHub. There were essentially no new comments compared to the first revision round so I will not make a new post for this. If you have comments, you can comment the Revision requested for the first manuscript post or GitHub. If there will not be objections I will submit the revision on Friday this week (16.10.2015). 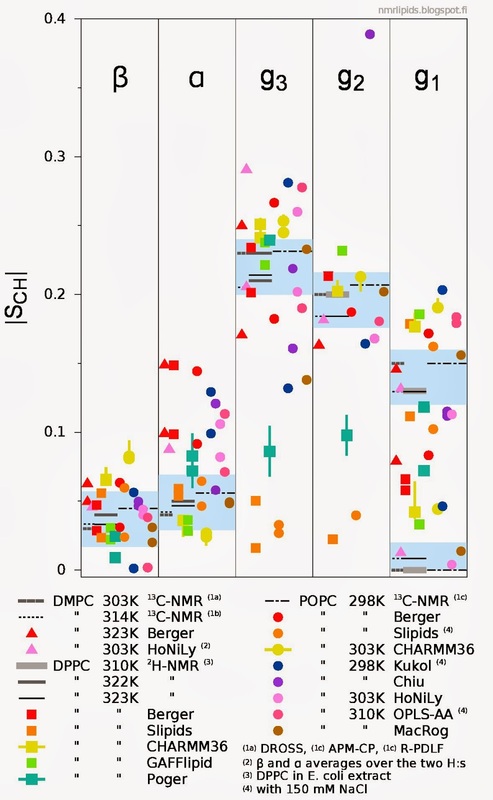 28.9.2015 NMRLipids V project: Review about validations of membrane MD simulations was published. This is a project to write an invited review on a topic strongly related to the blog content. 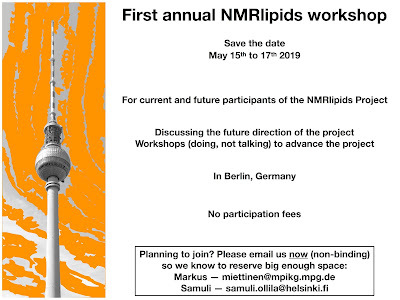 28.9.2015 The title of the blog has been changed to "The NMRlipids project: Open Collaboration to understand lipid systems in atomistic resolution". 24.9.2015 The NMRLipids project will be discussed in Mindtreck 2015 conference in Tampere. At least one of the sessions may be live streamed, see the facebook event. 22.8.2015 The revised version of the first manuscript is now submitted. 20.7.2015 Revision requested for the first manuscript post was published. 6.7.2015 About page describing the different subprojects and Workflow page suggesting new workflow for these projects are now published. "primarily directed toward an audience of specialists doing closely related work and that lack a clear description of impact on the broader field of chemistry" by the editor of the Journal of American Chemical Society and it was rejected without peer review process. Thus, the manuscript has been now submitted to the Journal of Physical Chemistry (another journal ran by american chemical society). 15.5.2015 The first manuscript produced in this blog is now submitted to the Journal of American Chemical Society. 12.5.2015 The first manuscript produced in this blog will be submitted to the Journal of American Chemical Society by the end of this weeḱ. 25.3.2015 Mapping scheme for lipid atom names for universal analysis scripts post was published. 17.3.2015 Towards first submission to journal (2) post was published. 9.3.2015 Current and future activity post was published. 6.2.2015 The first draft of the ion-lipid interaction manuscript was published. 16.1.2015 Towards first submission to journal post was published. 16.1.2015 The current version of the new manuscript is now updated to arXiv http://arxiv.org/abs/1309.2131v2. There will be soon a new post about the further proceeding. 23.12.2014 New version of the manuscript (2) post was published. 21.11.2014 New manuscript written on the results reported in this blog is available for commenting: New version of the manuscript. The manuscript covers only the results for fully hydrated bilayers, effect of dehydration and effect of cholesterol. A separate manuscript will be written about ion-lipid interactions. 18.11.2014 New manuscript written about the results reported in this blog will be made available for commenting on Friday 21th of November. 10.10.2014 Together with Hubert Santuz we have started a GitHub organization https://github.com/NMRlipids. It contains a repository: https://github.com/NMRLipids/nmrlipids.blogspot.fi. The idea is to collect all the relevant files related to the project there. There are already some files and there will be more. If you are familiar with git you can add your files by making a pull request. If you are not familiar you can also make as previously (add a link to a comment) and ask us to add it into the GitHub. Downloading the data should be straightforward without any understanding about the git system. It took a couple of hours for me to get familiar with the git system. The time was well spent and I recommend it to everyone. 7.10.2014 We have added a new page called Data Contributions as an attempt to arrange the discussion. The idea is that all the new data would be sent by commenting the Data Contibutions page. Yet, let us keep the other comments under each separate post. 1.9.2014 The post About glycerol conformations was published. 20.8.2014 Presentations describing the nmrlipids project in the International Workshop on Biomembranes - From Fundamentals to Applications were posted. 19.5.2014 The post Towards a new version of the manuscript was published. 13.5.2014 To Do List has been added as a page in the top panel. 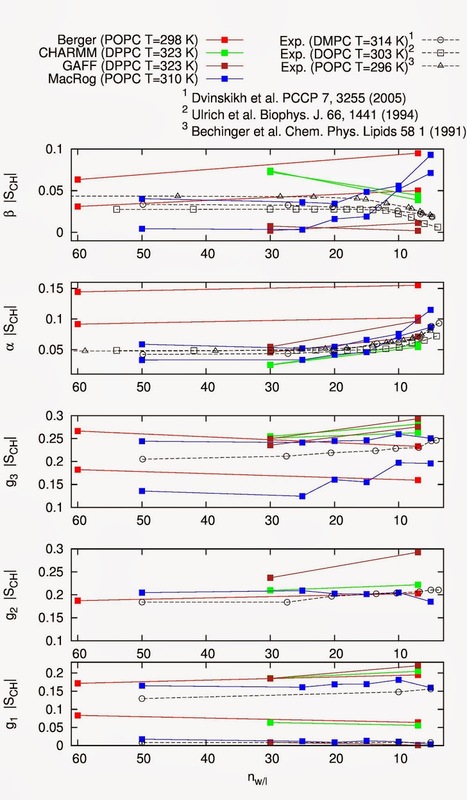 2.5.2014 The post Response of headgroup and glycerol order parameters to changing conditions: Results, reviewing the current results for the responses of the headgroup and glycerol order parameters to the changing conditions, was published. 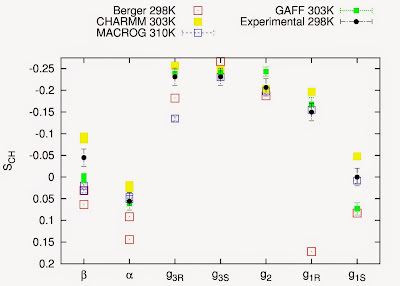 Now also the MacRog is in good agreement with experiments, in addition to CHARMM. 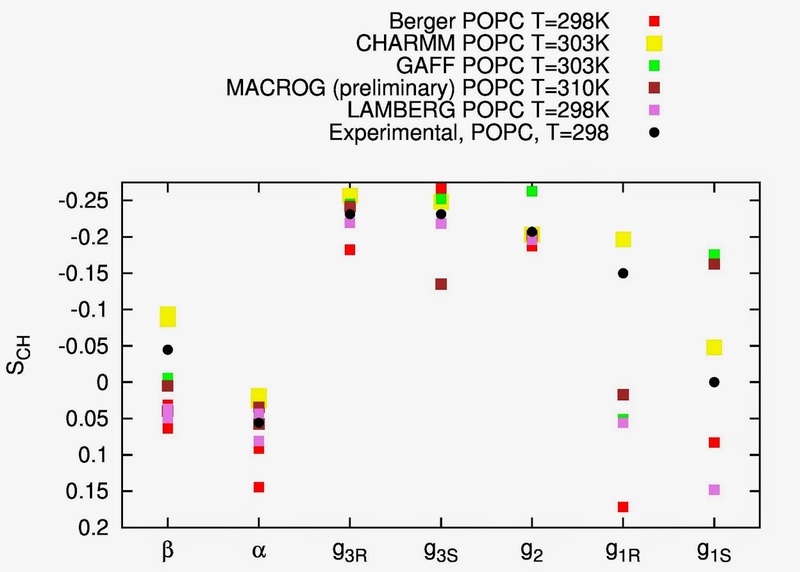 It seems that the CHARMM36 results are in the best agreement with experiments. (However, the R/S hydrogen labeling in MacRog has to be still confirmed). 16.4.2014 Patrick wrote a comment on how to tell R and S and hydrogens apart. 11.4.2014 The lipid forcefield comparison at full hydration updated—now contains results for 12 force fields. 10.4.2014 The post On the signs of the order parameters was published. 10.4.2014 We have added a page containing information about the authors of the project (see the top panel). It will now calculate also the sign. Also the *hdb file to protonate the Berger lipids with Gromacs g_protonate tool is now available. Note that there was a bug in the script shared in the original figshare package: It takes only the first 75 lipids in to account. Thus, if you have used it for the larger systems you have not taken all the available statistics into account. For my own Berger results, this makes a very small difference though. It would be very useful if someone would make a tool which would directly calculate the order parameters from the Gromacs *trr file. 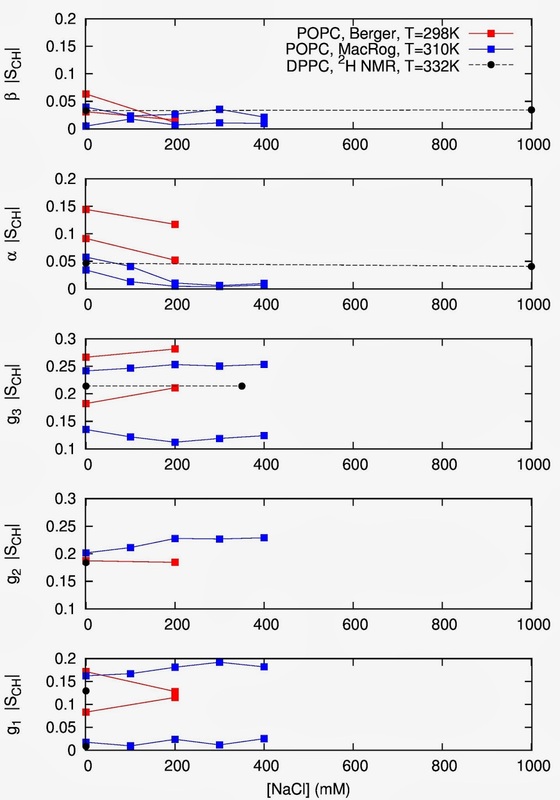 14.3.2014 The lipid force field comparison at full hydration was published. 9.3.2014 Antti demonstrated that it is possible to get a very good agreement with the experimentally measured order parameters by simply sampling a large set of randomly modified dihedral potentials, choosing the most promising ones, and repeating this randomised refinement a few times. 25.2.2014 This is our new front page: A simple list the most relevant events, ordered by date. Its purpose is to help you keep up with what is happening on the blog—in posts as well as in comments. 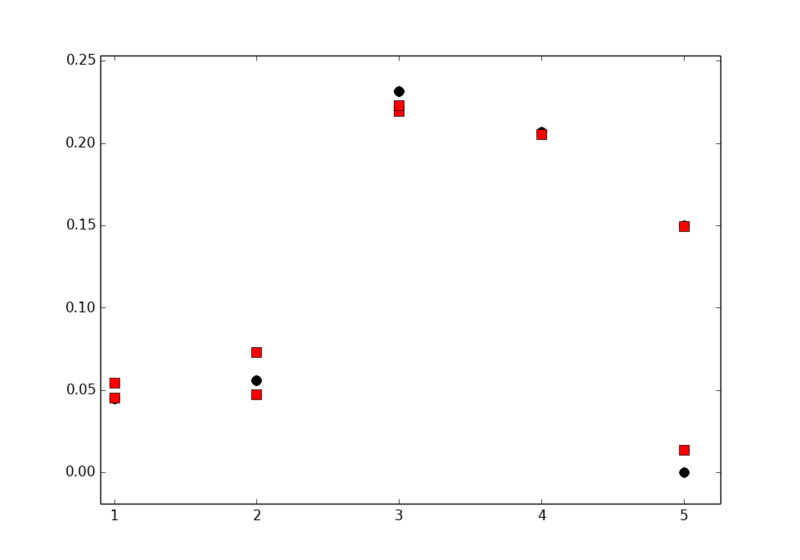 25.2.2014 Blog post discussing the accuracy of order parameter measurements was published. 16.2.2014 Samuli gave a presentation related to the nmrlipids-project at the Biophysical Society meeting. 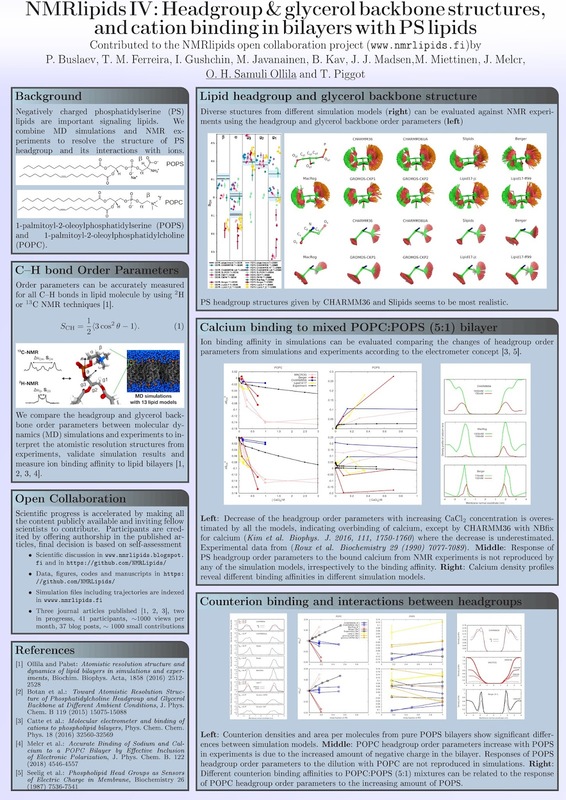 13.2.2014 The first attempt to modify the Berger dihedral parameters was reported with a preliminary conclusion that removing all dihedral potentials improved the choline- but impaired the g1 order parameters. 12.2.2014 Our current knowledge of the behaviour as a function of dehydration gathered into a single plot. 23.1.2014 Our current knowledge of the behaviour as a function of ion concentration gathered into a single plot. 23.1.2014 Our current knowledge of the behaviour as a function of cholesterol content gathered into a single plot. 21.1.2014 Our current knowledge of the full hydration behaviour gathered into a single plot. 10.12.2013 Patrick filed a Redmine Bug about reaction field simulations with Gromacs 4.0.7 not being reproducible with 4.5.3., which he commented first here on Oct 25th. 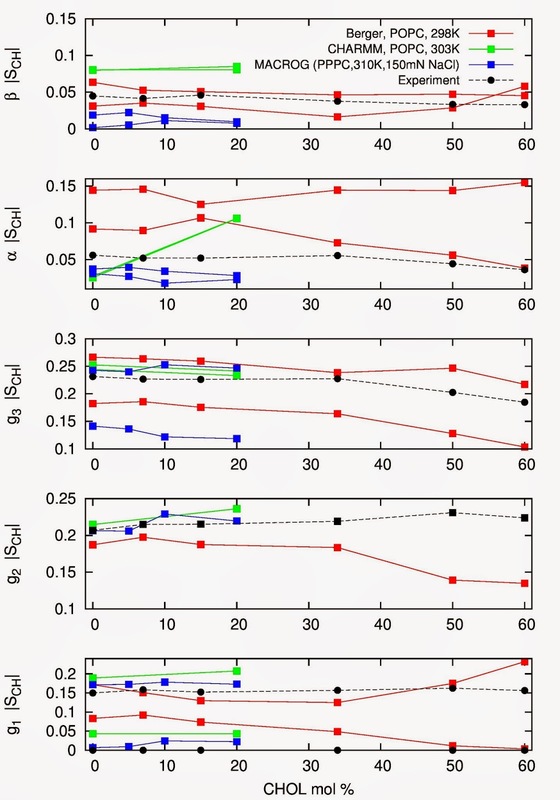 29.10.2013 Samuli wrote a guest post to the MARTINI group blog: PN vector orientation not a good measure for evaluating phospholipid force field performance, use head group order parameters instead. 2.10.2013 The first results were shortly reviewed and some short term goals were set in a new blog post. 13.9.2013 The first comment and the first contribution. 9.9.2013 The first version of the manuscript was published. 11.7.2013 The policy for publication credits was published. 3.7.2013 The nmrlipid.blogspot.fi was opened with a post that stated our aim. 28.6.2013 The project was first time publicly discussed in a presentation at the Biological membranes: challenges in simulations and experiments -meeting in Paris.